Inflation really is heating up… a reader’s “defense” of the pharma bro… the intriguing silence over Chelsea Manning… and more! We love to watch the mainstream play catch-up. Here at The 5, we’ve been raising doubts — or lowering expectations as the case may be — almost from the get-go. Our macro mavens Jim Rickards and David Stockman suspect the Trump agenda will be undermined by infighting in the GOP Congress. The debt ceiling, suspended since the autumn of 2015, comes back into force on March 15. Expect a donnybrook. But on this day… we come not to bury the Trump bump but to praise it. In our constant quest to stay ahead of the curve, we introduce a new line of thought you’re not seeing from the mainstream, blinkered by its hostility to Trump. And it’s not the big lumbering stocks of the Dow that will benefit most. “Companies like Apple, Microsoft, Exxon and the other big boys may go up in small amounts. But the smallest companies out there, the ones trading for pennies? We’re talking about life-changing gains. Louis has been scouring hundreds of small companies since Election Day to identify the ones most likely to double — or much more — under a Trump administration. Because these stocks are so cheap it’s easy to get started with a diversified portfolio with as little as $100. And the best time to start is now — before Trump takes office tomorrow. Check out Louis’ special report at this link — there’s no long video to watch. 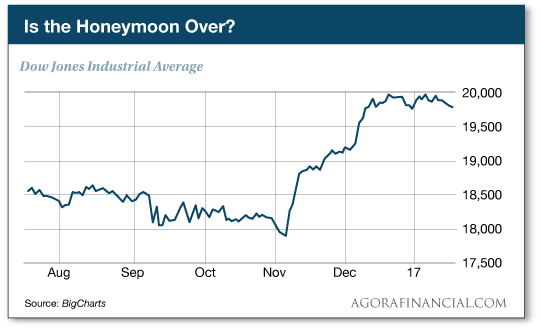 Yet again, the major U.S. stock indexes are meandering today: The Dow is off fractionally and back below 19,800. No, this is not a repeat from yesterday. Federal Reserve chief Janet Yellen’s twice-a-year testimony to Congress yesterday had little impact on stocks, more impact on other asset classes. She said the jobs picture is fine and inflation is moving in the right direction. You and I might quibble with those assertions, but the point here is that the Fed is still on track for three interest-rate increases this year. Thus, the dollar rallied and gold slipped — a trend that continues today. At last check, the dollar index was up to 101.6 and gold was $1,198. Yellen’s remarks also sent Treasury yields shooting back up; the 10-year is now 2.48%. In economic numbers, the Philly Fed survey of mid-Atlantic factory managers turned in a super-strong January result, the best since November 2014. In earnings-land, Netflix beat expectations. “This year, I expect earnings season to be an incredibly important period,” says our income specialist Zach Scheidt. “Of course, everyone is paying close attention to Trump and his economic policies,” Zach goes on, picking up where we left off moments ago. “Will Trump protect jobs in the U.S. and grow our domestic economy? Or will protectionist policies hurt the U.S. and ultimately lead to lower earnings? There’s not a straightforward answer. Instead, there will certainly be winners and losers. Result: “As companies announce 2016 figures and give us forward guidance,” Zach says, “stock prices should start to swing dramatically. “You may not see it in the broad market indexes. That’s because on average, the indexes could be tame. But the individual stocks that make up the indexes should start moving sharply. Long story short, big price swings make Zach’s “perpetual income strategy” even more profitable than usual. If you haven’t seen this system in action yet, you really need to see it put to the test. 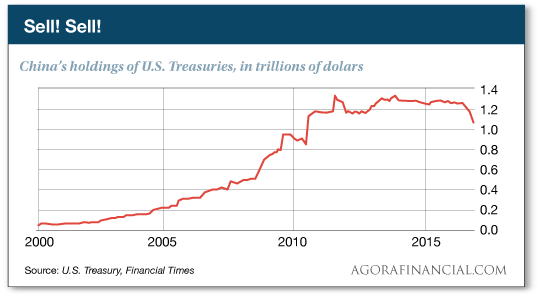 Nothing is being spared in China’s epic asset dump — especially U.S. Treasuries. As Jim Rickards has been telling us all week, China is burning through its foreign exchange reserves at a furious clip — so much so that China risks going broke by year’s end. Affirmation came yesterday with word that China’s holdings of Treasury paper have fallen for six straight months now. The new figures for November show China unloading another $66 billion. And with that, the Middle Kingdom’s Treasury holdings are now back to 2010 levels. The investment implications of that chart are enormous, and they also present enormous profit possibilities — as Jim explained for readers last night during a live online training session. If you missed it, you can click here to watch it right now; be advised we’re taking it offline at midnight tonight. The Education Department is starting to come clean about student loan defaults… and the picture is far worse than even we thought. As recently as last September, the department estimated that at 477 colleges and universities, more than half of students had defaulted or failed to pay down their debt within seven years. On Friday, the bureaucrats revised those figures. It’s now 1,029 schools — about a quarter of all the institutions they studied. Yikes. As we pointed out a few weeks ago, the Education Department has a strange system of accounting; it assumes it will never incur losses via the borrower’s default because student loans can’t be wiped out in bankruptcy. This is how the feds get to claim the federal student loan program is a moneymaker for “the taxpayer” — not that they ever send you a check, heh. Another perverse effect of this accounting: Student loan defaults don’t show up in the annual budget deficit. But the losses are no less real, and they do add to the national debt. For the record, the national debt totals $19.96 trillion as of Tuesday — the most recent figure available. No telling if we’ll cross the $20 trillion threshold in time for Inauguration Day… but for perspective, the national debt was $10.63 trillion on the day Obama was sworn in… and $5.73 trillion on the day Bush the Younger took office. “This may sound as though I am pro-Shkreli,” a reader writes after our chronicle of the pharma bro’s latest brush with the headlines, “but I am most definitely not. “But I am pro free markets. “It sounds like you believe he should be prevented legally (didn’t say morally) from jacking up the price of an old yet lifesaving drug. He should be innovating instead. “While there are many nuanced discussions involving this particular case that time and space don’t allow, I fully support Shkreli’s legal right to jack up the price of this or any other drug. “The markets will provide other alternatives when this kind of margin is available, even if it may be ‘illegal’ at first according to the FDA rules. And Shkreli’s company will eventually die at the hands of public opinion along with anyone or anything associated with him. And no, I don’t believe anyone would be allowed to die while this sorted itself out. “The real culprit in this mess is the FDA and its regulations, which are so convoluted and corrupted (caused by years of conflicting self-interested payoffs from Big Pharma) that they cost more lives than they save, according to many medical professionals. “Focusing only on Shkreli will result in a hue and cry from the proles for even more regulations to prevent this from happening again, which of course, gives even more power and regulatory convolution to the very agency that created this mess in the first place. The 5: We hear ya. Mainstream outrage in the autumn of 2015 was focused on Shkreli jacking up the price of an off-patent tablet from $13.50 to $750. Any criticism of him is incomplete without the deeper story we spelled out at the time… and yes, the FDA shoulders much of the blame. We got no reader feedback after our tribute to Chelsea Manning yesterday… which we find sorta revealing. We figured someone would spew venom about how we could support a “traitor,” but we got crickets. Fascinating, really, and we think it speaks to the divide between the Beltway class and the population at large. Not that readers of The 5 are representative of the population at large — you belong to a uniquely perceptive niche — but we daresay that people trying to get by and earn a living each day don’t have the same capacity for outrage as McCain and his ilk. Likewise, the polling data seems to indicate everyday Americans don’t buy into the Trump-as-Russian-puppet nonsense — well, aside from the 50% of Hillary voters who believe Putin actually tampered with vote totals. But the Deep State won’t give up. “As we approach Trump’s inauguration,” wrote Jim Quinn this week at his Burning Platform site, “it has become clear the ruling elite feel threatened and are using their control of the media, intelligence services, military and financial system to try and undermine his presidency before it begins. That’s why he has tomorrow circled on his calendar. As soon as Trump takes office, further tensions could send the price of gold through the roof. And there’s one tiny gold firm… trading for just $9 per share… that could easily reap the BIGGEST gains. Immediate details from Jim here.